IPNA memberships are $5.00 per year and require that you either live, own property, or operate a business within the boundaries of Inman Park, and also that you maintain your online account. Homeowners, renters, landlords, and businesses that want to be a part of this community should register on this website and join our community ranks. We’ve improved our Security Patrol membership options by adding new levels of security and new payment options to make it a better fit for every member. We will also be able to send you reminders prior to the expiration of your support so there is no lapse in service, and an online payment system will allow for an annual payment or an automated monthly transaction. If you live in a condo or apartment, your homeowners' association or property management company may already participate in the IPSP. However, this does not give you automatic membership in the IPNA. You still need to register for a $5.00 online membership. Also, you may still choose to support the security patrol by establishing an individual IPSP membership or making an additional contribution. Please read the FAQ to answer some questions or email us at [email protected] for any additional assistance. This application is for individuals only, if you are a Business, HOA or Property Management Company you should please contact [email protected] for your membership options. If you don't need to read the instructions you may go directly to the Application here. This is what to expect when registering or updating your account. 1. Logging Into the application. When you select the membership link below you will see this form. 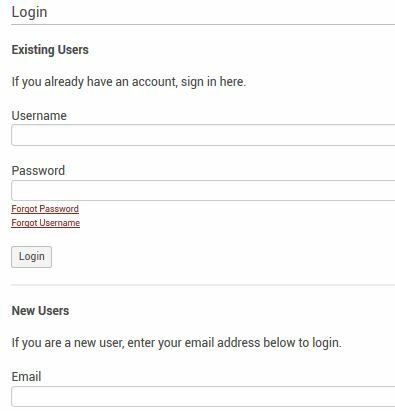 If you have a username (your email) and password please use the Existing Users link on the top of the form. If you have an account and just forgot your password, select the Forgot Password link. If you think you don't have an account, enter your email address in the New Users section just below. If you select New Users and you see a message saying that email address already exist. Please follow the Forgotten your password link to reset your password then start again. If you have to reset your password please follow the link below again and use Existing Users section. If you already have an active account with IPSP and you try to set up a new account but it shows No Form Fields Were Submitted, please select the Go to My Profile button on the website and review your current account. You will be notified via email well before it expires. 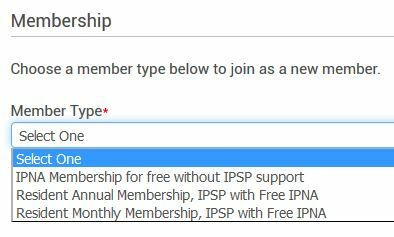 IPNA Membership for free without IPSP support. Resident Monthly Membership, IPSP with Free IPNA. Resident Annual Membership, IPSP with Free IPNA. If you elected to support IPSP you will need to choose one of 4 levels. 3. Fill in the personal information in the form. 5. Submit and you are done. 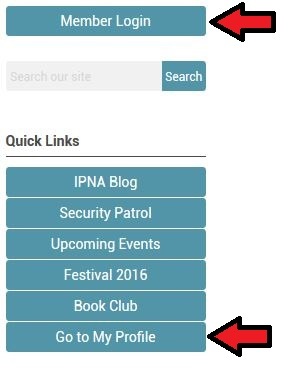 When you return to the IPNA website you may select Member Login and then you may update your profile information (add a picture perhaps) by selecting the Go to My Profile button. Question: Am I required to join the IPNA or support the IPSP? Answer: No, nothing is mandatory. However, if you wish to enjoy any of the privileges and benefits of being a member then you are required to at least have a Free IPNA membership. Plus, to make IPSP more inclusive we have created payment options like monthly billing and lower level entry points to fit every budget. Question: Previously I had an account and listed my Spouse/Partner and we both had memberships but now we both have to setup our own accounts. Why is that? Answer: We have more features in our new system that will allow for individuals to have connections to various groups and social activities. This connects with our events calendar and offers a new way for the groups to connect plan and communicate. All of this requires individual accounts. Question: I live in a Condominium/Apartment or belong to a HOA and I think they pay for security patrol for me. Am I an IPNA member already and can I also support the Security Patrol by signing up for IPSP for myself? Answer: You are not an IPNA member just by belonging to a HOA or by virtue of living in Inman Park. Each adult must setup an account online to receive the IPNA benefits . As for Security Patrol, while some of our local Home Owners Associations or Property Management groups do contribute to IPSP, some do not. Regardless, if you want to be a member of the IPNA you must at least setup a Free IPNA membership. You can also join the IPSP as some of your neighbors do because they understand how vital the patrol is in keeping our neighborhood safe. Again...email James at [email protected] for any additional assistance.